I like when companies put out the same pencil in completely different ways. One for business, one for fun. The regular Zoom is gorgeous and minimal, and if I'm being honest, looks like a glossy version of the Baron Fig Archer. I've been using it next to my Confidant at work for the past few days and they fit perfectly together. But when I come home, I don't want a boring gray pencil...the same core exists in a fun triangle pencil with candy colors and cool striping. So I can switch and still enjoy the same writing experience. That's pretty cool. The Zoom gives you a couple options for looks and shape. If you want to go serious, go with the regular Zoom, it's hex shaped and "English Gray, with stripes" which is a fancy way of saying it has four shades of gray, and if you count what the pencil writes, five! But if you're not feeling super professional, the Zoom Triangle comes in three colors: pink, blue, and purple. All of these colors are somewhat pastel and feel like Easter colors. The pink one is my favorite, because even though it's pink, it feels the least "Easter" to me. These come with a fat white stripe near the top of the pencil and thin white stripes along the triangle edge. The hex is thicker than the triangle, but surprisingly, the triangle is heavier by about half a gram. If a pencil isn't going to be made of cedar, I think I like whatever wood these pencils are made of second. This wood cuts really well in hand sharpeners, and while you won't get a perfect shavings flower, you don't have to struggle to get a straight cut, and it doesn't flake near the point. On the triangle I could see the seams easily, but in the two pencils I went through, it never pulled away from the core. These are graded as 2B and advertised as "Ultimate Dark". These are as dark and smooth as a Blackwing 24, and I would say that they're true to grade. Point retention is equal to a Blackwing 24 as well, even on toothy paper. Ghosting will occur, but i was surprised at how little it smudged. After a dip in the CP-80. I thought Zoom Zoom was a Mazda thing? This is a definite recommendation if you're like me and like a smooth dark line and a softer pencil core. I swear I will review a harder pencil at some point, but all these Indian pencils are really dark and smooth. And I kinda love it. That's why I've been doing this series: I love this kind of pencil. How many Field Notes can you use before you start just buying them for the theme instead of their usefulness? That's the same type of situation here. I know all these pencils are super similar, but for me, that's the point. I know what kind of core I like, I'm looking for something that might surprise me within the realm of things I know I'll like. And who can go wrong with free sharpeners and erasers in every box? P.S. the eraser in the Zoom Triangle is scented, and smells like my grandma's guest bathroom. P.P.S. 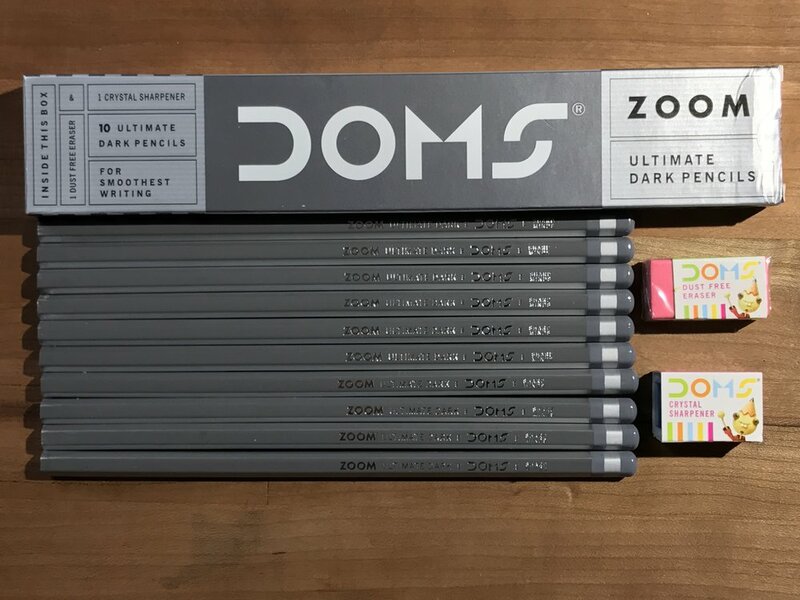 the Zoom Triangle also comes with a Faber-Castell ruler. Available on Amazon, $6.99 for Zoom, $7.99 for Zoom Triangle.